With only three days to go to the big day I imagine most people are now well into last minute, undoubtedly feverish, preparations - if you are only just starting, I salute your courage. In our house the Christmas countdown begins in early December with our first foraging trip. This takes place in true urban-hunter style at the BBC Good Food show where we ruthlessly track down cheese, fudge and the never-before bought spirit which will form the basis of this year's Christmas morning cocktail. As with hemlines and heel heights, alcohol goes through fashions: this year, if foodie events and bar openings are any indicator, the current spirit of fashionable choice is gin. Marking celebrations with alcohol is nothing new and all civilisations show evidence of fermentation-based drinks. Jars dating back to 6500 BC have been discovered in neolithic villages in China with residues from a drink made from grapes, hawthorn berries, honey and rice. The wine-loving cults in Classical Greece and Rome associated with Dionysus and Bacchus are well-documented, wine jars bearing inscriptions attesting to the quality of their contents were discovered in Tutankhamen's tomb and large-scale production of wine appears to have originated in Iran as early as 5400 BC. Whether the purpose was to honour the gods, provide medicinal relief or because the consequences of drinking water were judged more dangerous than drinking alcohol, it seems that man's desire to turn fruit into something a little livelier is almost as old as the quest for fire. distillation of alcohol. From that point on, we didn't look back: from eaux-de-vie to akvavit to usquebaugh, the "water of life" was born. Think of gin and you automatically think of gin and tonic, the quintessential English drink associated (at least in my mind, I live in Glasgow so I haven't actually witnessed this) with long hot summers, floaty frocks and croquet. Gin is widely known as the English drink and the world's oldest working distillery, which has been in production since 1793, can still be visited in Plymouth. The drink, however, originated in Holland where it was known as Jenever: the first mention of medical-tonics containing juniper (thought to be able to protect against a range of illnesses, including plague) is found in a Dutch manuscript dated 1269, with the first confirmed production beginning in the early 17th century, again for medicinal purposes. Given the social ills eventually laid at gin's door, it is somewhat ironic that it was first prized for its medicinal qualities. 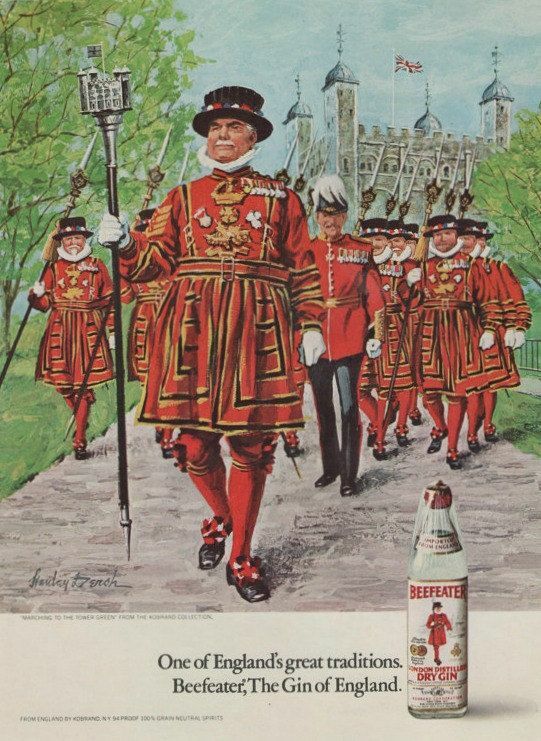 The Dutch used it to treat gout, gall stones and stomach complaints and the Royal Navy mixed it with lime cordial to combat scurvy and angostura to combat sea-sickness; given that tonic water contains quinine which has anti-malarial properties, it really was a drink to beat all ills. Gin has also added a couple of phrases to our lexicon which are still in common use: Dutch Courage and Mothers' Ruin. The first has rather heroic connotations with its idea of soldiers stiffening themselves before battle and stems from the morale-boosting and damp-beating tots of Jenever given to British soldiers fighting in the Thirty Years War in Holland (1618-1648). Perhaps the meaning has now become rather more derogatory in the sense of turning to drink for false courage but it is still nowhere near as damning as Mothers' Ruin with its whiff of women whose collapsed morals in the face of the demon drink threaten the very fabric of society. From the accession of William of Orange in 1689 anyone in England could distill gin and was encouraged to do so, to boost trade and provide capital for his ongoing wars. 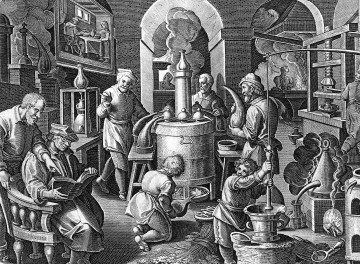 In 1730 there were 7000 gin shops in London alone and the quality was dreadful: the use of cheap additives such as turpentine could leave drinkers crippled, blind or dead. The regulation attempts which began in the 1730s led to the sumptuous gin palaces frequented by the rich in early Victorian England but also pushed the worst traders underground, perpetuating the abuse of unregulated alcohol by the poor. From its earliest appearance in England, gin had female connotations, going by the name of Madame Geneva (a corruption of Jenever). As its less salubrious effects took hold, more common personifications included Jenny Pisspot and Dorothy Addle-Brains and, by 1820, Mothers' Ruin. The origin of the term is still debated. Some have linked it to the use of gin and hot baths as an abortive device but its hold on the popular imagination comes from the famous Hogarth depiction of Gin Lane whose most squalid inhabitant is the mother dropping the child, probably based on a contemporary convicted child-killer, Judith Dufour. This depiction of a slatternly woman so lost to drink she has forgotten her most basic role is the first time we see an alcohol-reformer, which is what Hogarth was, portraying a female as a villain rather than a victim of drink. Up to this point, reformers concerned with the drinking of ale tended to paint women as the victims of their neglectful and violent drunken husbands. Gin, however, was not drunk in male-dominated ale-houses, it was made, sold and increasingly drunk by women. Gin Lane is full of grisly images of debauched savagery brought on by the evils of drink, specifically gin, with its anti-madonna depiction of the mother and child deliberately centre-stage. It is important to remember, however, that the drawing, although based on some of the poorest and most gin-affected areas around St Giles, was rather more than just a depiction of London life. Gin Lane was produced as part of the movement pushing for the reform of the gin laws and may well have been funded by the beer industry. Its companion piece, Beer Street, depicts a group of happy workers, surrounded by the tools of their trade to advertise the contribution they make to society. There is a woman centre-stage but she is looking down and decorously dressed: she knows her place. The availability of cheap, dangerous alcohol in the eighteenth century was a major social problem and its consequences, particularly for the poor, were terrible but it is hard not to see a very anti-female rhetoric in much of the reforming zeal. Reform, at its heart, fears change and women changing, whether that be their attitudes or their behaviour or their sense of their place in the world, carries a threat to the social order. A ban on selling spirits to women was proposed and the dangers of female drinking became a newspaper staple: "when I behold the woman...degraded into the most infamous habit of drinking...when I see deadness in her features, folly in her behaviour, her tongue faltering, her breath tainted...my concern, like her debasement, is inexpressible (Universal Spectator, 1737). The debate about the dangers of alcohol continued into the nineteenth century and regulation brought, as it often does, a refinement in quality. Gin's image began to rise. New advances in distilling technology which refined the spirit's taste, its espousal by the Royal Navy and the increasing spread of influence through the Empire made gin (and tonic), rather ironically, a symbol of all that was good about England. With the growing popularity of cocktails after the end of prohibition, gin found itself associated with a new decadence, once that was aspirational rather than feared and Gin and It (Italian sweet vermouth) became the drink of choice for bright young things everywhere, including bright young women. Love this - cheers, Catherine! I'll have your share then! I have just returned from a gin quest in Argyll and managed to bag three bottles, found in whisky shops in fact. I've always thought gin smelled like cheap perfume and never felt inclined to try it. Great post. Gin doesn't agree with me, but hey! Enjoy your cocktail. Very interesting and instructive post. Of course alcohol did use to be safer to drink than water..